In this article we investigate and check out the best garden hose. For me, a good quality hose is a "must have" so as you can be easily able to use it primarily around the garden. You can of course use it for a range of other tasks such as pressure washers, washing the car etc. Its main purpose though is to be able to use it to water flowers, gardens, lawns etc. Not to have it springing a leak, especially when connected to an outside tap. If you have ever used a hose before, and suffered from either of the above problems, then you will know just how frustrating that can really be. Underneath, I have made a table of the best rated garden hoses, that are currently available in the United Kingdom. These are based on buyer ratings which use a star system, with 5 being the highest rating and 1 being the lowest rating. These are from buyers who have bought the product, used it and then taken the time to leave a review. That makes them very valuable. This is a 50 metre hose and please note that there is no reel with this one. Buyers rate this one highly with an average rating of 4.7 out of 5 stars, which is an excellent rating. This one comes with a 30 year guarantee, is designed for heavy use, and is easy to roll and unroll. 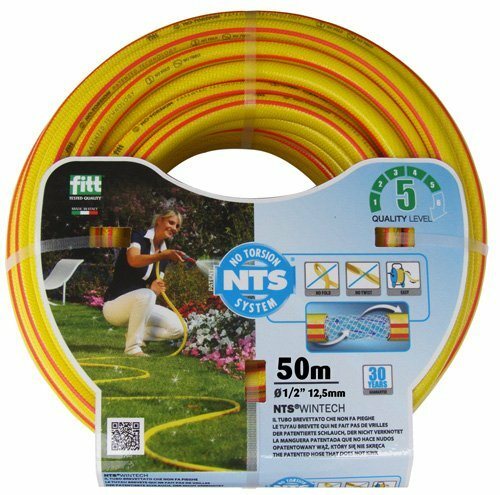 This is a long hose at 50 metres and is ideal for those with bigger gardens. Buyers really like this one a lot, though be aware that a few buyers have said, that it can still kink, but that it doesn't hold the kinks when next used. This is a 100 feet hose (30 metres)and please note that there is also no reel with this one. Buyers rate this one highly with an average rating of 4.5 out of 5 stars, which is a very good rating. It is made from latex and can expand up to 3 times the original length. This one does come with a spray gun that has 7 settings. It is easy to store and drains very quickly. 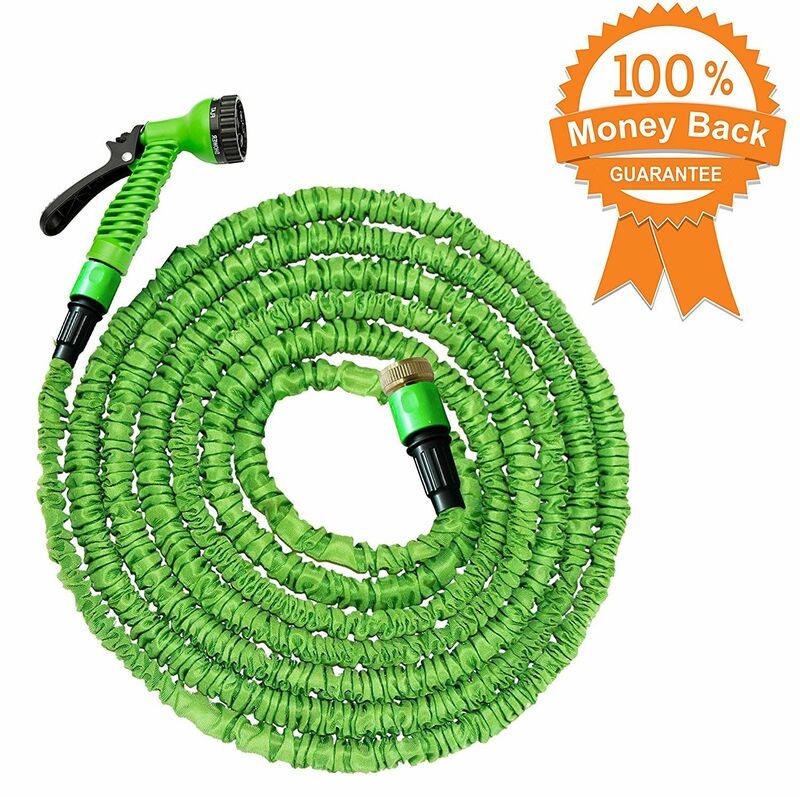 As you can see this garden hose comes with a money back guarantee, so if you are not happy with your purchase, you can quickly and easily get your money back. It comes with a 2 piece connector which will fit an external tap. This hose is NOT suitable for sprinklers and will not connect to a normal kitchen tap. It is light and compact. This is a 25 metre hose and comes with everything that you need. This is the one that I own myself and would also recommend to anyone. It is also the best seller at Amazon UK, and at several other gardening websites. Buyers rate this one highly with an average rating of 4.4 out of 5 stars, which is a very good rating. 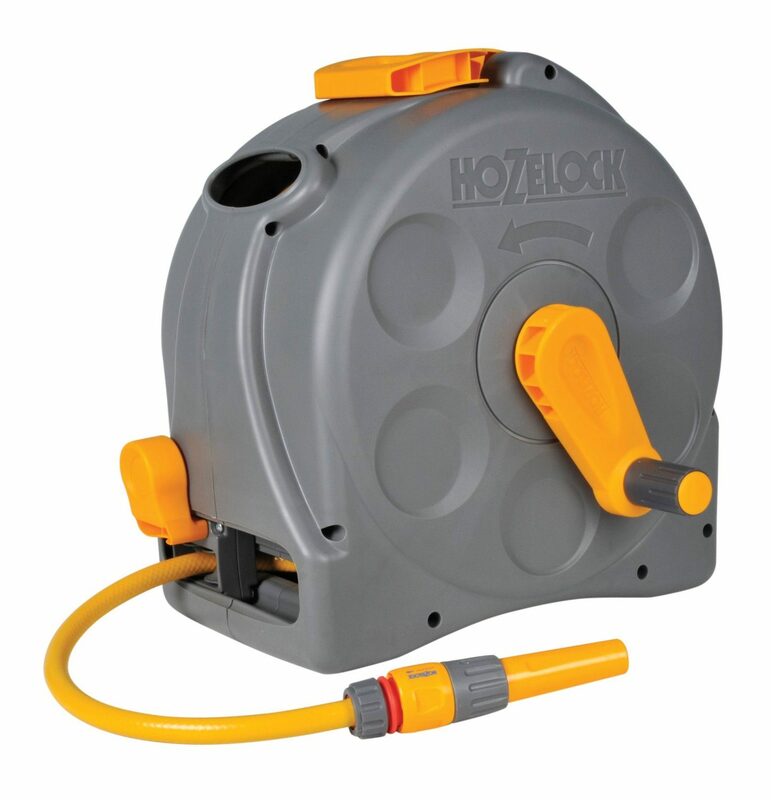 This hose is enclosed within the reel, has a carrying handle, a viewing window, and a very easy manual rewind action. This is what I call a "proper hose." It comes with all the fittings, is neat and tidy and the length of the hose allows me to do all my gardening jobs, hosing down my driveway, and is still long enough to reach my car. You can use it as a free standing model, or attach it to a wall if you prefer. Personally I think it is the best one on the UK market right now. This is a smaller 10 metre hose and ideal for those with smaller gardens, patios or any type of small garden space. Buyers rate this one highly with an average rating of 4.4 out of 5 stars, which is a very good rating. 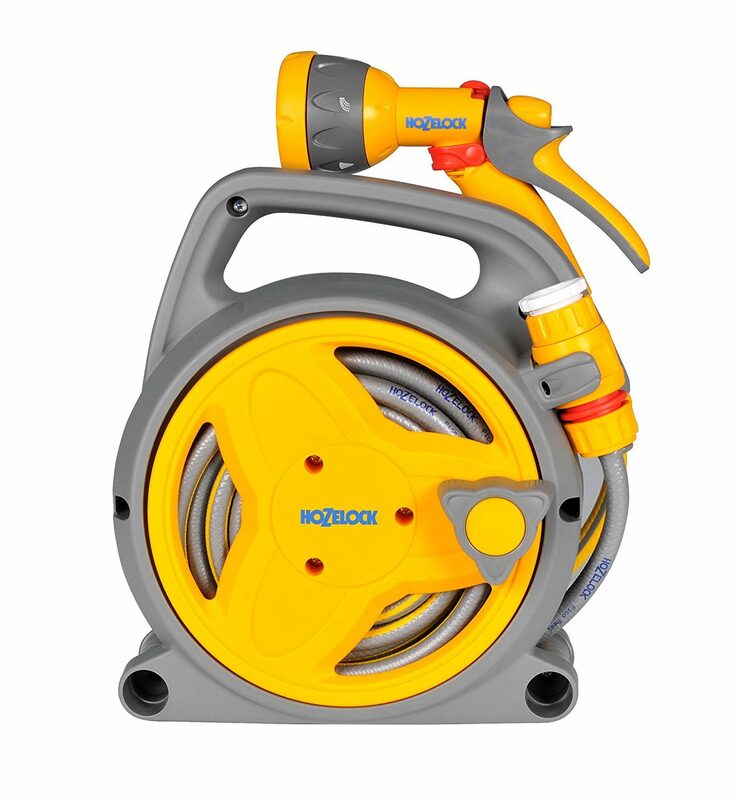 Like the one above, this Pico hose is enclosed within the reel, has a carrying handle, and is nice and compact, making it easy to store away. It comes with a 5 function spray gun, is lightweight, easy to rewind and even easier to store. Please be aware that at 10 metres, the length of this hose is very small. This one would only be suitable for people with small gardens. Think about 10-15 normal steps and that is the total length of the hose. This is a larger 30 metre hose and comes in the very traditional hose cart style. Buyers rate this one highly with an average rating of 4.3 out of 5 stars, which is a very good rating.You can see from the image below that the wheeled hose cart, makes this one a great deal easier to move around and position. You can also buy this one in a 50 metre size. This is a good choice for those with larger gardens, or for anyone who is not able to carry around a normal hose. It does not come with the connector that fits from the tap to the hose and that is really annoying, so be aware of that. As you can see from the table above, the Hozelock brand are by quite a way the most popular choice for most UK gardeners. I own one myself and have always found them to be reliable and very well made. The other two on the list, which do get slightly higher buyer ratings, are the newer forms of hose, that are supposed to be wrinkle or kink free. Below I have included a buyer's guide which I hope you will find useful. For those of you wanting to replace or buy a new garden hose, then this will be a very useful guide, that will help you make the best choice. What Length of Hose Do You Need? 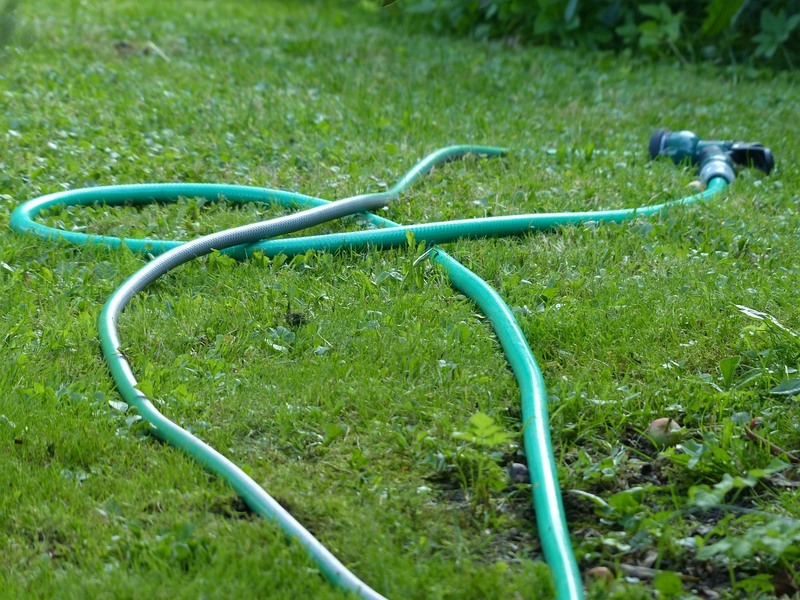 Forget about the hose kinking or bending when thinking of buying a hose. In my opinion the biggest mistake made when buying a hose, is that most people buy one that is too short. I have seen so many people doing this and it is a huge mistake. Have a think about what you will be using the hose for. Is it for doing the gardens, washing the car, cleaning down patios etc? Then pace out the distance from the tap where it will be connected to the farthest area where you will need the hose to reach. the average pace size is about 2.5 feet. Count up the paces, and then multiply by 2.5 and you will get the length you need in feet. That is the length of hose that you will need. This is probably the most annoying thing of all. You are using your hose and bingo, the water drops to a dribble or stops altogether. You look around and there is a big kink in the hose pipe. You fix that, go back to your work, and bingo it happens again. Over the years I have used lots of hoses and all of them are prone to this bending and kinking. Some are a great deal worse than others.​ Please take my advice and avoid buying any type of cheap hose. It will drive you insane!!! 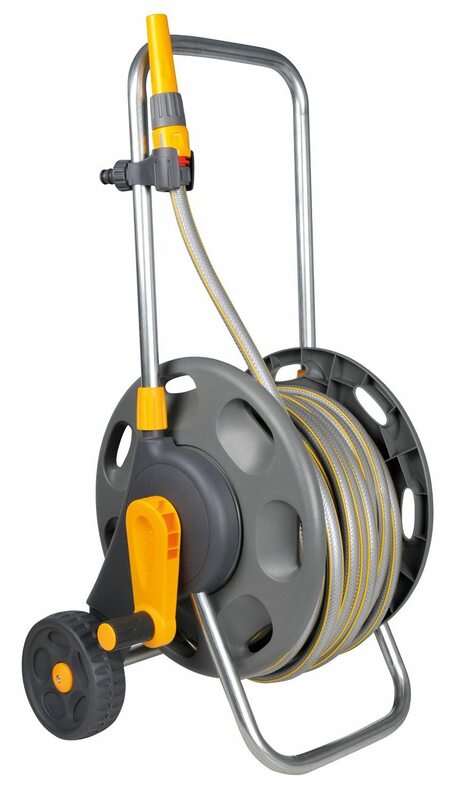 For a good quality hose and reel, expect to pay around £35-40. For that you get a tough strong hose that will not kink, and will last for years. If you have never worked with hose fitting before, they may just drive you to distraction, especially when they leak. Something that "should" be very straightforward can often become quite complex. 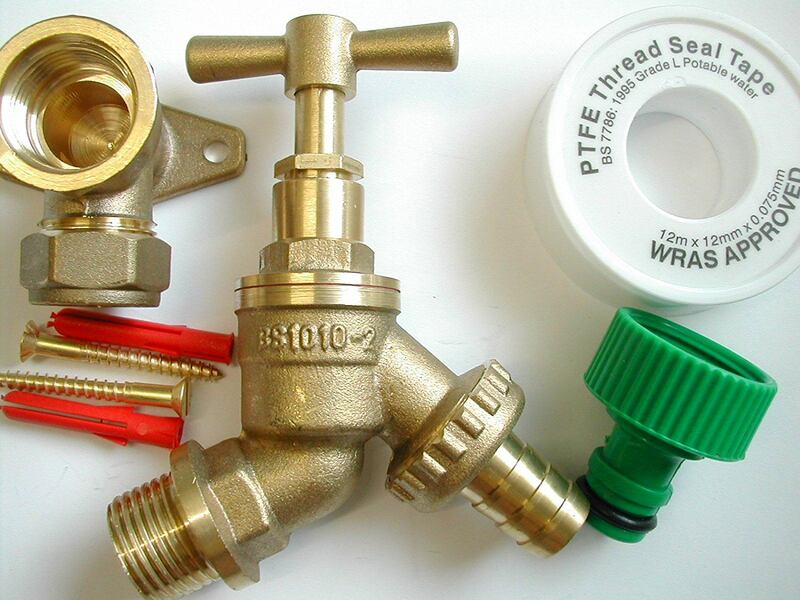 There are essentially only two fittings that you need to do. The first is from the tap to the hose or to the hose reel, and the second is from the other end of the hose to the spray head. For far too long I struggled with trying to fit a hose to the kitchen tap. (Much to the complete annoyance of my good lady) This is simply a very bad idea. if you haven't got an external tap, then I urge you to buy one and either fit it yourself, or get one fitted. You will fall in love with it. An external tap like the one above costs under £10 and makes your life a great deal easier. The only difficult bit is drilling the hole through the wall so as you can tap into the main water pipe.